Over the years of entering shows, I have developed what I think is a pretty good system for hanging quilts. I like my quilts to hang as close to the wall as possible. I always want them to hang flat, flat, flat. 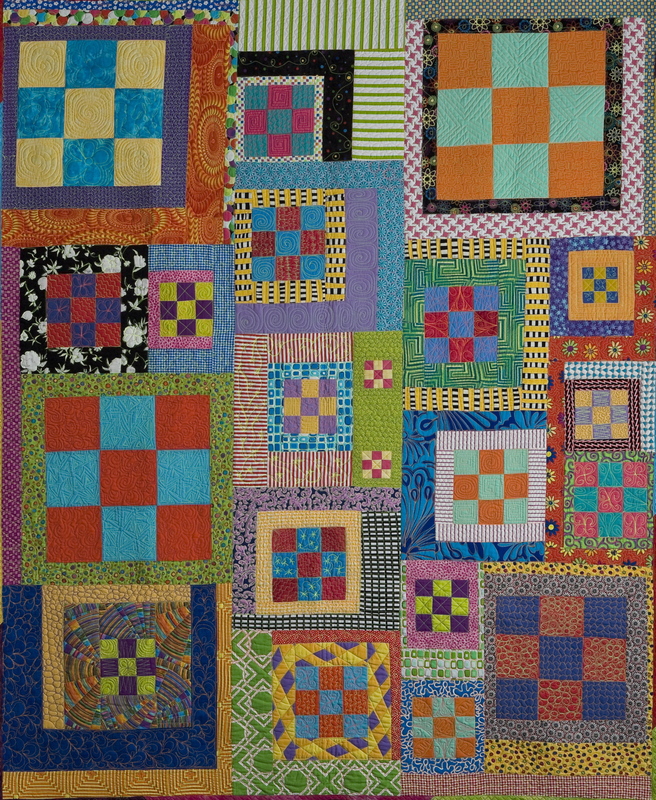 Nothing makes me madder at myself than to see one of my quilts hanging with a wavy bottom. Here is my process for getting the desired effect. The best hanging sleeve instructions around were created by the amazing quilt artist Libby Lehman. While I have never met Libby, she has been a juror in many of the shows I have entered. In fact, she gave me my first award–a first place in the Art Quilt Category at the Albuquerque Fiber Arts Fiesta in 2007. Wow. it feels like yesterday and hundred years ago that I made Boxy 9-Patch. Libby has been experiencing some serious health problems. I think about her every time I use these instructions and send her healing thoughts. I hope you will do the same. If you would like to follow Libby’s path to recovery you can by clicking here and scrolling to the bottom. I have modified the instructions only slightly. Libby’s instructions call for cutting your fabric nine inches wide. I cut my hanging sleeve fabric 5 inches wide by the width of the quilt. Traditional quilt shows use a tube system for hanging the quilts which requires a larger sleeve. I use a slat system which does not. Addiontionally, I do not like how a HUGE hanging sleeve looks a small quilt. It feels so out of proportion. Next, I fold both ends of the fabric under twice, about 1/4” each time. This creates a nice clean edge. You could just stitch these hems once, but I like to create a top stitch look–here I have stitched three rows. I like how it looks, and it helps keep the hanging slat from snagging on the hanging sleeve. Next, iron the hanging sleeve in half WRONG sides together. The only purpose of this crease is to serve as a visual guide for you. Now iron both long edges to the meet that crease. You sleeve will now look like this. Ignoring all crease marks for now, pin the two long edges together and stitch. You no longer need the center crease, but you DO need the other two creases. They are the guides for where you should attach the sleeve to your quilt. When you are done stitching the sleeve to the quilt, you will have 1/4″ ease for your slat or hanging tube. Carefully, iron your this seam to one side or another. Your sleeve will now look like this. The top of the sleeve is supposed to curve as it is doing in the photo. This means you did the sleeve correctly and that there is a 1/4″ ease for your hanging tube or slat. You are now ready to attach the sleeve to your quilt. I usually put the sleeve about 3/4” down from the edge of the quilt and center it. Use a ruler to help you get the placement right. I use my finger to check the sides. The sleeve should end about finger width inside the quilt edge. It should be the same on both sides. If it is not, you did not center the sleeve properly. Pin the sleeve in place. I like to use stiffer pins for this work. Hand stitch all the way around the sleeve attaching it to the back of your quilt. Because I quilt my quilts so heavily, this can be a very time consuming process. With each stitch, I must flip the quilt over to make sure the stitch isn’t showing on the front. If the quilt is a large one, I then repeat this entire process for the bottom of the quilt. Yep. I make two hanging sleeves for all of my quilts except for the very smallest ones. Here is what the back of my quilt looks like when I am done. I suppose you might be curious about what the front of this quilt looks like as well. It is called Family. If the quilt is particularly long, I install two hanging sleeves on the top and two on the bottom with about a 2-3 inch space between the sleeves. This enables me to ship the quilt folded. The next step is to prepare your hanging slats. Walt purchases these slats at the hardware store. The slates are labeled “Alum-Flat 1/8″ x 1”- 8 FT and are made by Steel Works. I am sure any aluminum slat will work. To make a slat into hanging slat you need a drill and hacksaw. Slide the slat into the hanging sleeve until it is approximately 1/2” from the edge of the quilt. On the other side of the slat mark where you will make your cut. Cut the slat with your hacksaw. Next, drill a hole about 3/8” from the edge of the slat on both sides. Your finished slat will look like this. I always write my name and the name of the quilt on the slat. If I have more than one slate for a quilt, I number them. For example, if my quilt has four slats, I label them Name of Quilt, My Name, Top Slate #1, and so on. These are screws that go with the slats. Buy these at the hardware store when you buy your slats. Here are some of the quilts hanging in our home using this method. I hope you found this information helpful. The next exciting step in this process is shipping your quilt. I know it is a cliff hanger, but you will just have to wait. 24 Sep	This entry was published on September 24, 2013 at 11:44 AM. It’s filed under My Process-Quilts and tagged Hanging a Quilt. Bookmark the permalink. Follow any comments here with the RSS feed for this post. Thanks for posting this. Just one clarification, you stitch the tube closed with WRONG sides together, since you never see the back of it? I have been doing it with right sides, then turning it. I guess that’s just an unnecessary complication that I can skip!? Sharon- You are right. You can stitch the hanging slat with wrong sides together. That seams then is hidden when you stitch the hanging sleeve to the back of the quilt. That way your slat won’t get caught on the seam when you slide it in. Thank you for stopping by. Thanks. I have about 10 quilts to finish and now I know the trick. I wish I had elves to do all the hand stitching so I could keep working on the fun parts!! I know what you mean. It seems like some in our family should step up and do the handwork! Do u put any type of finish on the aluminum to keep it from discoloring the fabric? I haven’t done this yet so I haven’t known this to be a problem, but one of my husband’s friends mentioned the possibility to him. Well, the sleeve in a way “protects the quilt” from the metal. I have had quilts hanging in my house this way for almost a decade without any problems. That said, a museum curator would probably suggest something else. I do know that wood can damage quilts,but so far metal has worked for me. I hope this helps and thank you for stopping by! No sense in adding an unnecessary step.